Description: In the late afternoon, a southbound Kansas City Southern train was rolling past the station at DeQueen, Arkansas with SD40-2 662 and SD40's 605 and 619. Description: A SB freight passing through DeRidder, LA. Description: KCS 662 and TFM 2650 lead a train of brand new grain hoppers by the Amtrak platform in Beaumont. Description: KCS 662 leads an empty grain train by the Amtrak depot at Beaumont. Description: Two older KCS Locomotives take a mixed freight up the Pittsburg Sub. north of Drexel. Description: Sitting in East St. Louis. 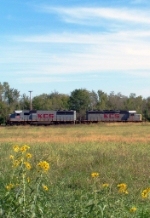 Description: KCS units at the yard in East St.Louis.